Why Do I Need A North Phoenix Termite Inspection? Other reasons you may require a termite inspection include buying a home. Oftentimes, the lender wants the assurance that there are no underlying issues, especially if you live in an area that is as prone to termites as North Phoenix. Varsity Termite and Pest Control is available to conduct free home inspections in your home or business. Being in the know about possible infestations and damage is the first step to solving the issue at hand. When selecting your termite inspector it is important to hire someone who has the credentials and the experience to be able to conduct that inspection. A thorough home inspection should last anywhere between 30 minutes and several hours. You should also receive a report upon completion and be offered some advice or course of action should termite activity be recorded. Because of the large presence of termites in Arizona, we generally recommend an annual inspection, and why not? Varsity’s North Phoenix pest inspections are free of charge and obligations and offer a great way to protect your home or business. While termites may seem like innocent little creatures that cannot do a lot of harm, you should keep in mind that because they feed on cellulose and wooden components of your home (even plastic and silicone in some cases) they can not only cause serious financial damage to your home, but in theory cause your building to collapse. That is some serious damage, we are talking about here. 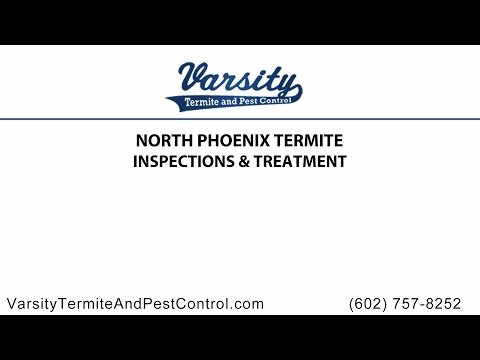 If your termite home inspection has revealed the presence of said creatures in your home, the extermination experts with Varsity can assist you in getting rid of the termites and also develop a North Phoenix termite treatment plan and schedule, whether it’s the use of the Sentricon Termite Colony Elimination System or other various effective methods. Varsity is a top rated North Phoenix exterminating company, and we are proud of our great results and the long lasting relationships we build with our clients. We even offer 100% guarantee on the services we offer. We work hard so you can feel at ease in your own home and not get bugged. In addition to termites, we can assist you by conducting scorpion home inspections, remove and control roach populations, ants, spiders and other potentially harmful pests.